A new comedy about a woeful mouse who is swallowed by a wolf and learns he is not alone...a duck has already set up a lovely little home. A charming story offering the signature wit and whimsy that readers of all ages have come to expect of Barnett and Klassen. Thanks to our good friends at Walker Books Australia and to welcome Mac Barnett's and Jon Klassen's hilarious new picture book collaboration, we have five signed copies of The Wolf, The Duck & The Mouse to giveaway. This picture book is sure to satisfy fans of fractured fairy-tales and fables and has been described as an 'unparalleled new literary comedy' by Children's Book Daily. To win your copy, simply tell us in 25 words or less what animal you would dine with if you could dine with any animal at all, and why. Be one of the first to read this book before it's release next month. Email your answer along with your name and postal address to dimity. The response we like the best will win one of five copies. Competition is open to anyone, worldwide, so long as they have an Australian postal address for delivery of the book. Please note, we cannot deliver to PO Boxes. Entries without a name and street address will be ineligible. Winners will be announced right here on our website on Friday 27 October 2017. Competition runs from 5am Wednesday 18 October to 5am Thursday 26 October 2017. Adults can enter for those aged 17 and under. This is a game of skill, not chance. The judge’s decision is final and no correspondence will be entered into. 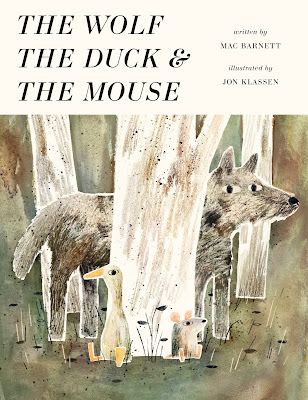 Listen to the two incredible creators The Wolf, The Duck & The Mouse by clicking on the trailer below.